"Any fruit can be used, but this is my favorite combination. Try your own creation, but if you wish to use oranges and grapes in the same recipes, DON'T add the oranges until ready to serve or the grapes will be extremely bitter." In a blender or food processor, combine banana, orange juice, lime juice, poppy seeds, raspberry vinegar, olive oil, raspberries, salt and cayenne pepper, and puree until smooth. Cover tightly and refrigerate until ready to use. This is different, I thought it needed some additional sweetness. Next time I will add some sugar or 1/4 cup of maple syrup. Thanks for the recipe. I'm not a fruit salad fan at all so I didn't even taste this. 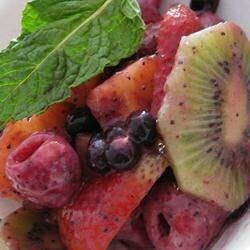 But hubby loves fruit salad and he did like it, thus 4 star rating.